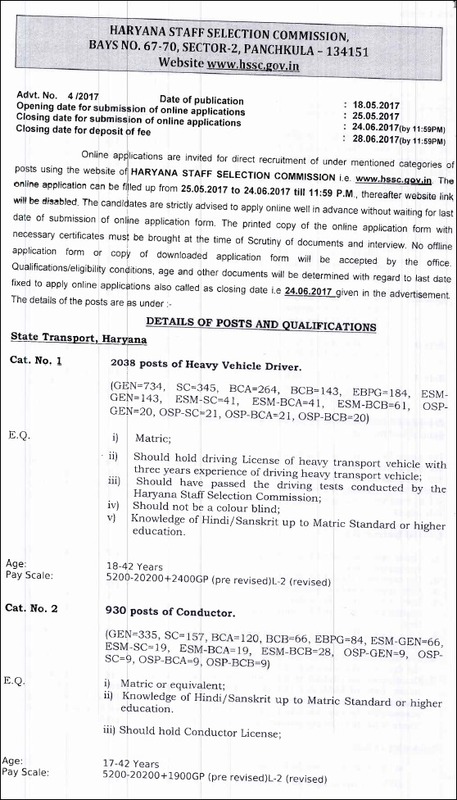 HSSC Driver & Conductor Recruitment 2017 Apply for 2968 Driver & Conductor Posts at hssc.gov.in - Haryana Staff Selection Commission (HSSC) had released advertisement no. 4/2017 for 2968 Driver & Conductor posts. The forms are to be filled online up to 25 May 2017. Quick details of this Haryana Driver & Conductor bharti are given below. General: 734 posts, SC: 345, BCA: 264, BCB: 143, EBPG: 184, ESM-GEN: 143, ESM-SC: 41, ESM-BCA: 41, ESM-BCB: 61, OSP-GEN: 20, OSP-SC: 21, OSP-BCA: 21, OSB-BCB: 20. General: 335 posts, SC: 157, BCA: 120, BCB: 66, EBPG: 84, ESM-GEN: 66, ESM-SC: 19, ESM-BCA: 19, ESM-BCB: 28, OSP-GEN: 9, OSP-SC: 9, OSP-BCA: 9, OSB-BCB: 9. 2. Candidates should have heavy transport vehicle license and 3 years driving experience of heavy transport vehicles. 3. Candidate should have passed driving tests conducted by HSSC. 4. Should not be a colour blind. 5. Knowledge of Hindi/Sanskrit up to Matric standard or higher education. 2. Knowledge of Hindi / Sanskrit up to Matric standard or higher education. 3. should hold conductor license. The online application form can be filled via hssc.gov.in. Application form submission starts: 25 May 2017. 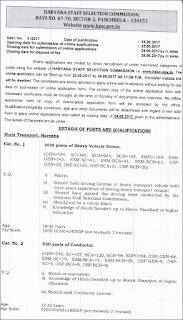 You can check out the HSSC Driver & Conductor notification from below.